Marcus Miller, Jazz Lover, Hat Lover. 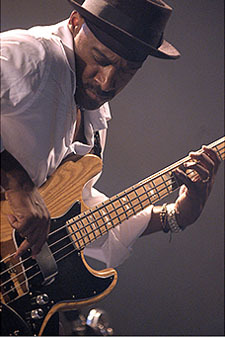 Marcus Miller (born William Henry Marcus Miller, Jr.; June 14, 1959) is an American jazz composer, producer and multi-instrumentalist, best known as a bass guitarist. Throughout his career, Miller worked with trumpeter Miles Davis, pianist Herbie Hancock, singer Luther Vandross, and saxophonist David Sanborn, as well as maintaining a successful solo career. Miller is classically trained as a clarinetist and also plays keyboards, saxophone and guitar. Miller was born in Brooklyn, New York City, in 1959 and raised in a musical family that includes his father, William Miller (a church organist and choir director) and jazz pianist Wynton Kelly. By 13, Marcus was proficient on clarinet, piano and bass guitar, and already writing songs. Two years later he was working regularly in New York City, eventually playing bass and writing music for jazz flutist Bobbi Humphrey and keyboardist Lonnie Liston Smith. Miller soon became a first call session musician, appearing on over 500 albums by such artists as Michael Jackson, Herbie Hancock, Mariah Carey, Wayne Shorter, McCoy Tyner, Frank Sinatra, George Benson, Dr. John, Aretha Franklin, Elton John, Grover Washington, Jr., Donald Fagen, Bill Withers, Chaka Khan, LL Cool J andFlavio Sala.